HAVE YOU TRIED DIETS AND FAILED? DO YOU WANT A COMPLETELY NEW APPROACH? A Gastric Band is a radical, surgical operation that reduces the available space in the stomach. 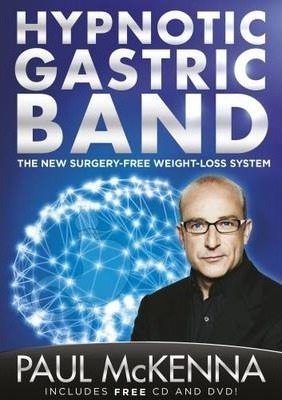 Paul McKenna's Hypnotic Gastric Band is a psychological procedure that can help to convince the unconscious mind that a gastric band has been fitted, so the body behaves exactly as if it were physically present. Along with the book, the system contains a hypnosis CD and an instructional DVD to provide complete support for physical and psychological change whilst you lose weight. There's no physical surgery, no scarring and no forbidden foods. Just follow all the instructions and let Paul help you lose weight. "This book may save the National Health Service millions of pounds - it offers people a safer, non-invasive method of significant weight loss"
Over the past twenty years, Paul McKenna, Ph.D. has helped millions of people successfully lose weight, quit smoking, overcome insomnia, eliminate stress, and increase self-confidence. He is Britain's bestselling non-fiction author, having sold 3 million books in 3 years, and his TV shows and live appearances have been watched and attended by hundreds of millions of people in 42 countries around the world.